Just a note and few photos to show you where I am using some of the ASMA lumber on a local history project. 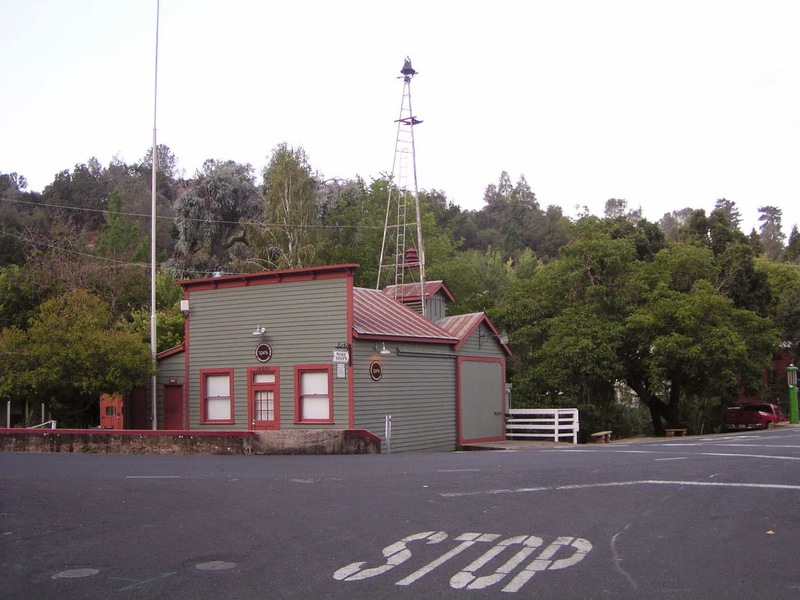 As part of the Amador City bridge replacement project, the old City Hall and Fire House had to be disassembled and moved out of the way for construction. The structure(s) sit on the bridge deck. Once the bridge was rebuilt, the City Hall and Fire House were put back in almost the same location. 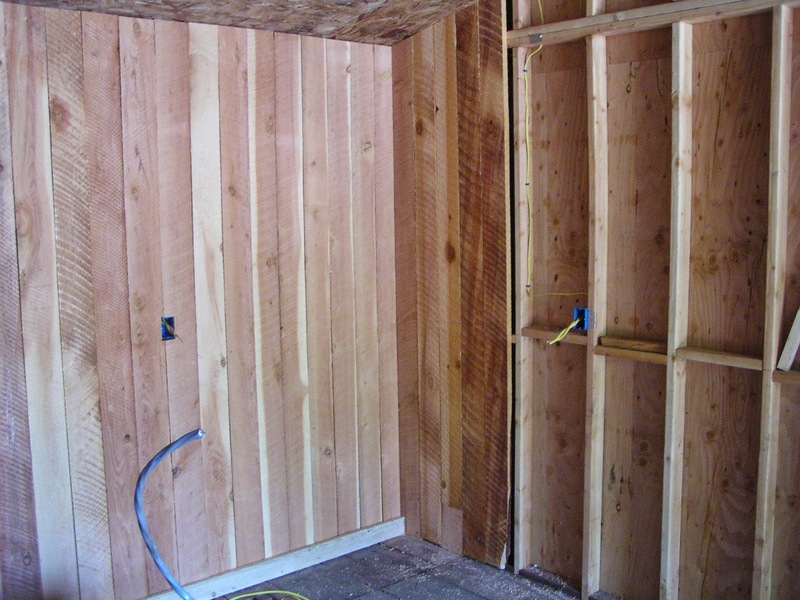 The rear part of the old fire house was so rotten that there was nothing to save, so it was rebuilt with new materials. If you look closely in the photos, you might also see the new steel box frame inside the building that supports the fire bell tower. 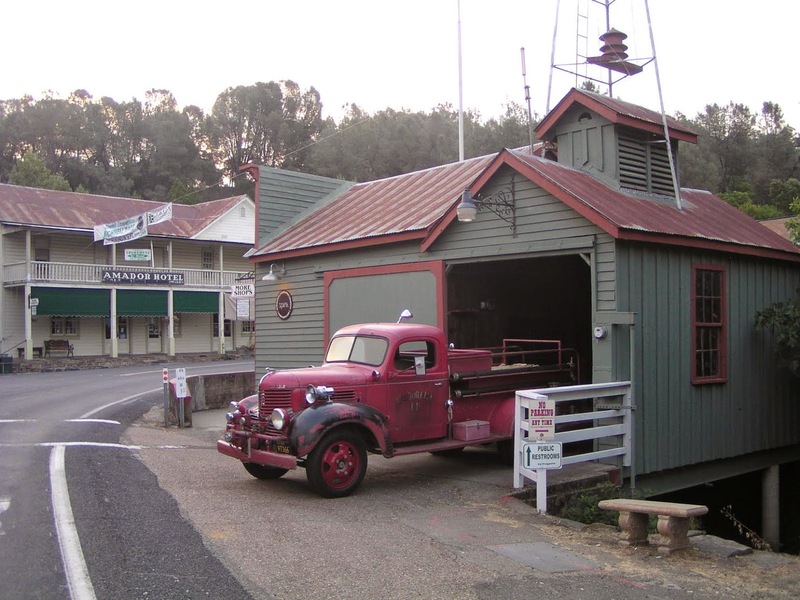 The plan for this fire house for many years has been to develop it a mini fire museum to house the Amador City 1939 Dodge fire truck that was built in Sutter Creek. 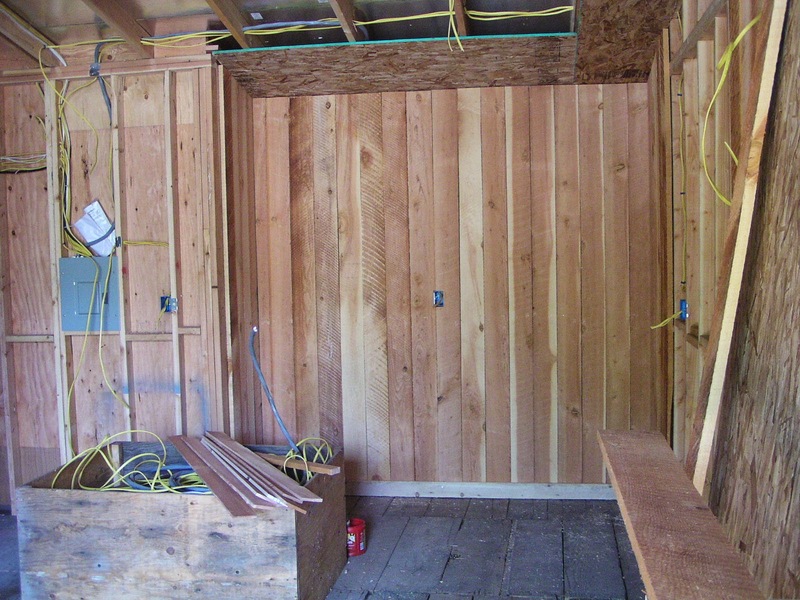 So, I am using some of the ASMA 1 by 6 lumber to panel the interior of the new rear section of the fire house. Once the wood work is done, I plan to finish the interior to try to better blend the new wood into the old. Finally sand and refinish the floor with oil. 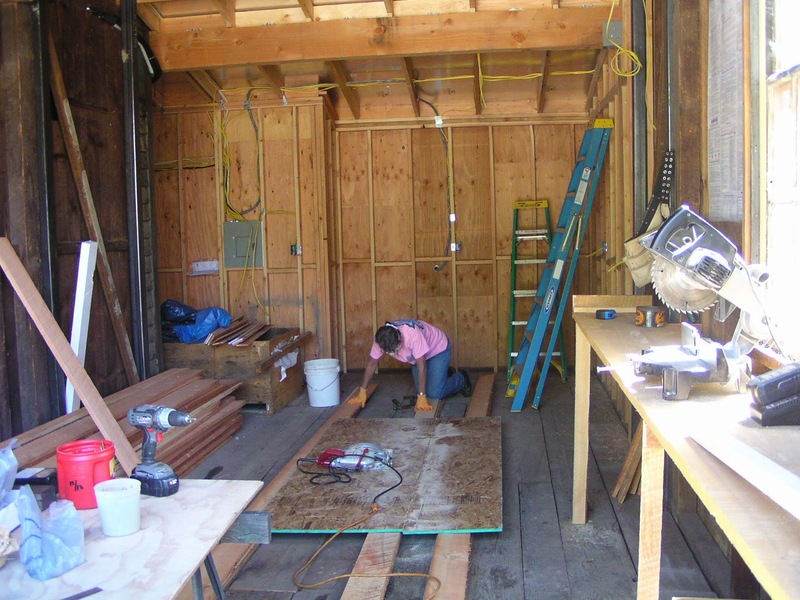 Mimi is shown pulling tacks and nails out of the decking to prep for sanding. We are adding wiring for lighting and we will be adding windows in the front door, so that the old Dodge can be viewed in the evenings, as well as during the day. The old Dodge runs great, it currently has 1098 miles on it. What's happening at the South end of town in Sutter Creek? Lots of people and heavy machinery have been milling around a dilapidated old parking lot. This new project is going to transform the parking lot into an historical Park and Gold Mining Display. 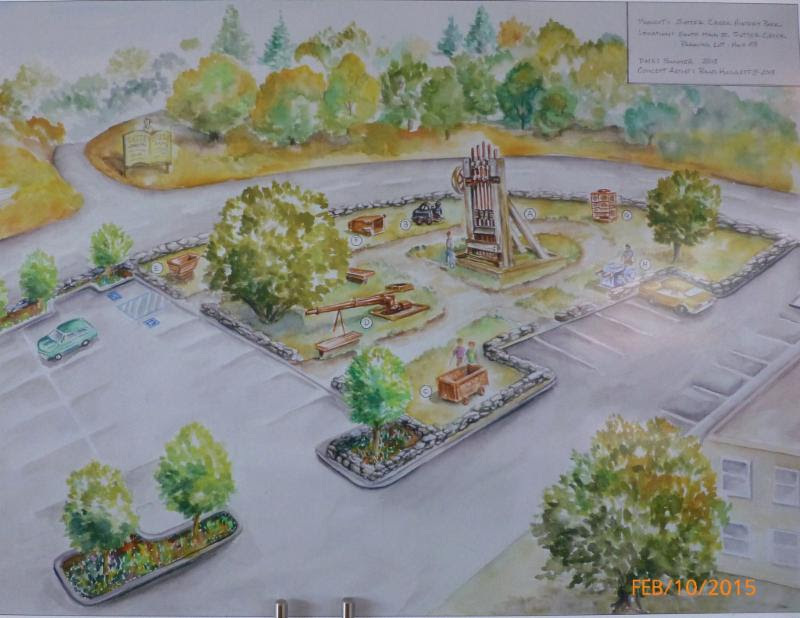 The Sutter Creek Community Benefit Foundation has partnered with the City of Sutter Creek in designing this beautiful park, which will include actual artifacts from local gold mines. This project is spearheaded by SCCBF founding Chairman Frank Cunha along with help from Ed Arata, Robin Peters and Louis Boitano, who have secured the historic mining equipment for this project. 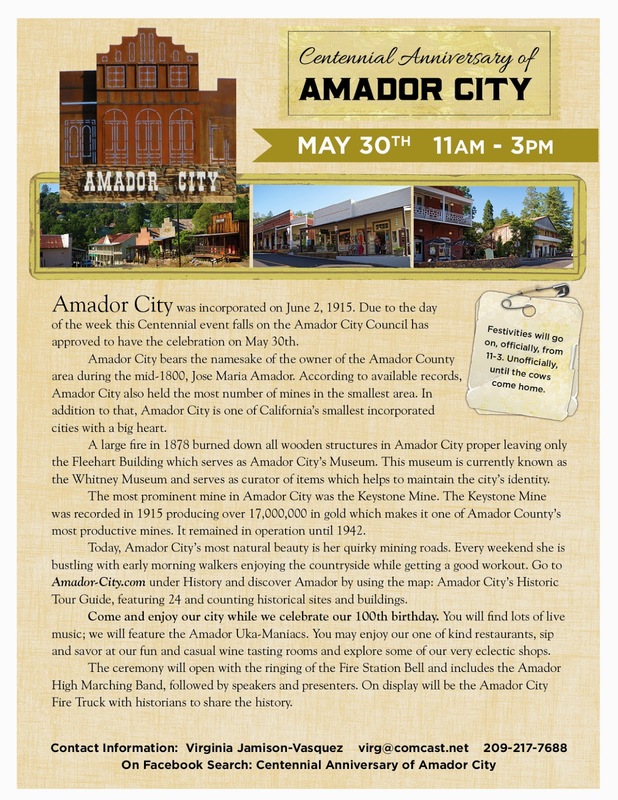 Last summer, the Amador Sawmill and Mining Association used their historic sawmill, located in the Amador County Fairgrounds in Plymouth, to cut the timbers that will be used for rebuilding a 5 head stamp mill. 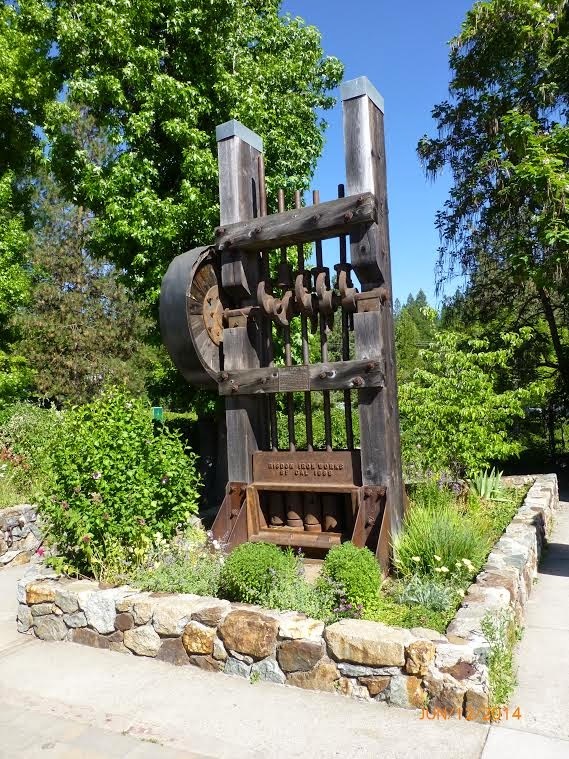 Built in 1882 at the Knight Foundry in Sutter Creek, the stamp mill will be the focal point of the new Park and Gold Mining Display. Other mining artifacts going into the display will include a mine head frame, mucker shovel, ore cars, rock drills, compressor, hoists and other artifacts used in the process of extracting gold from the earth below. There will be information plaques telling about each individual item, so everyone can learn about what part they played in our history. Final touches to the renovated parking lot will be a "hand stacked rock wall” encompassing the entire lot and new trees that will be planted to give the parking lot a welcoming, fresh new look. The Sutter Creek Community Benefit Foundation is busy raising funds to start the work for this project. Their "Kick-Off" fundraising event will be the "1st Annual Shrimp Feed", to be held on May 9th at the Native Sons Hall, 56 Main Street, Sutter Creek. This amazing dinner will include: All you can eat Shrimp and Cocktail Sauce, Pasta, Salad, French Bread, and Ice Cream. There will be fabulous items on display for a Silent Auction and the evening wraps up with a delicious Dessert Auction. Tickets for the event are only $40, with cocktails at 6 pm and dinner at 7:30. To purchase tickets call (209) 267-1003. This dinner is sponsored entirely by the Native Sons of the Golden West, Amador Parlor #17 and all proceeds will be donated to the SCCBF to help sponsor the South Main Park and Gold Mining Display. 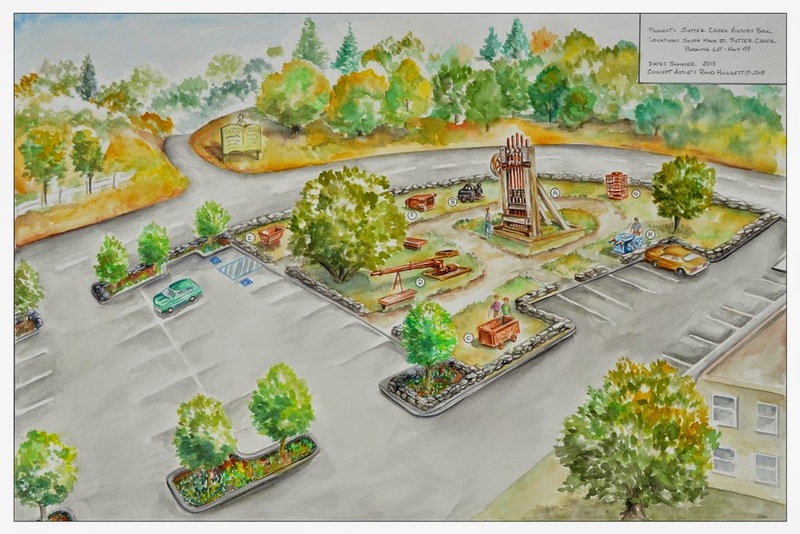 The Sutter Creek Community Benefit Foundation and the City of Sutter Creek are also sponsoring a "Name the Park" contest.This new Park and Gold Mining Display needs a great new name. You can submit your ideas to City Hall no later than May 11th. The Park will not be named after or in honor of any person. Please give us your ideas since this park will be a part of Sutter Creek forever and will need a good name. The Sutter Creek Community Benefit Foundation has already received generous donations from local entities such as the City of Sutter Creek, the Native Sons of the Golden West Parlor 17, S.C Lions Club, S.C. Business Association, and the S.C. Promotions Committee, as well as local citizens who are all helping to sponsor this project in some way. This project has an estimated cost of $175,000 and your donations would be so very much appreciated. This Park and Gold Mining Display will be here for generations to come and we need to do it right. Your help is needed. To donate or to become a member of the exciting organization please visit WWW.SCCBF.ORG or call 209-560-6888. All donations are tax deductible. If you are interested in helping with general maintenance and small improvement projects at the South Main Park Project, please email Frank at frankc49@comcast.net to be added to the contact list. SATURDAY MAY 9th at the Sutter Creek Native Sons Hall - 56 Main Street, Shrimp Feed Kick Off Party fundraiser for the South Main Park. Hosted by the Sutter Creek Community Benefit Foundation and the Native Sons of the Golden West. Limited Tickets available for recipients of this email, After April 7th we will open up sales to the general public. Please contact Frank Cunha at frankc49@comcast.net or 209-267-1003 if you would like to purchase tickets. Tickets are $40 per ticket. The dinner includes: French Bread, Salad, Pasta, Shrimp and cocktail sauce with a bowl of ice cream after the dessert auction. Submit your ballot to City Hall no later than May 9. Park will not be named after or in honor of any person. The park, will be located at the south end of Main Street , will be a "Passive Park" and will host historic mining artifacts as well as additional parking spaces. The artifacts will be located under and near the large tree at the south end of the lot. 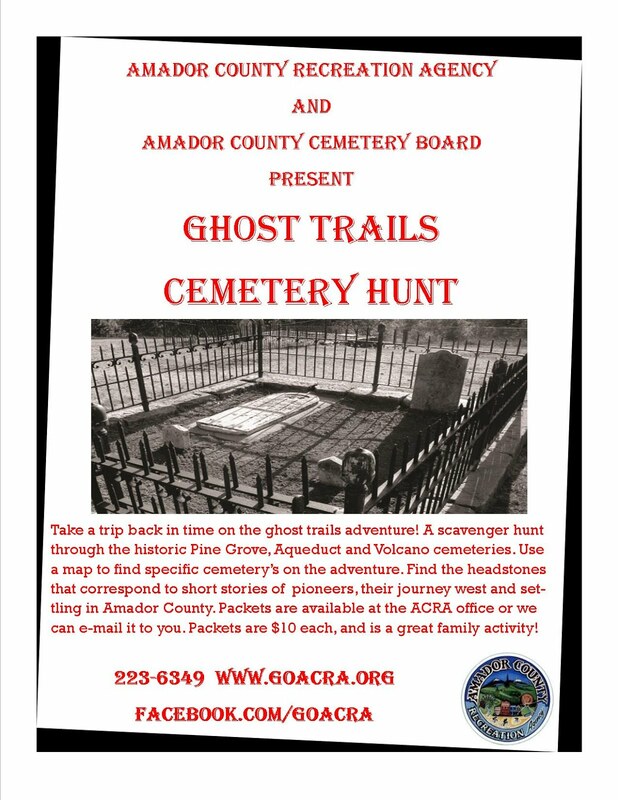 The City of Sutter Creek, in conjunction with the Sutter Creek Community Benefit Foundation are sponsoring this project. Did you know we have giants among us in Sutter Creek? In 1856 R.C. Downs, Leland Standford's partner in the Lincoln mine, married Rose Williams of Connecticut. When Rose first traveled to California to live with her husband she arrived via steamship to San Francisco, paddle wheel ship to Sacramento and finally a stagecoach to Sutter Creek. Although Rose first lived in Sacramento until her house was completed, she brought with her a couple of seedlings to plant at her new house in Sutter Creek. One was a Southern Magnolia and the other was a Shagbark Hickcory. 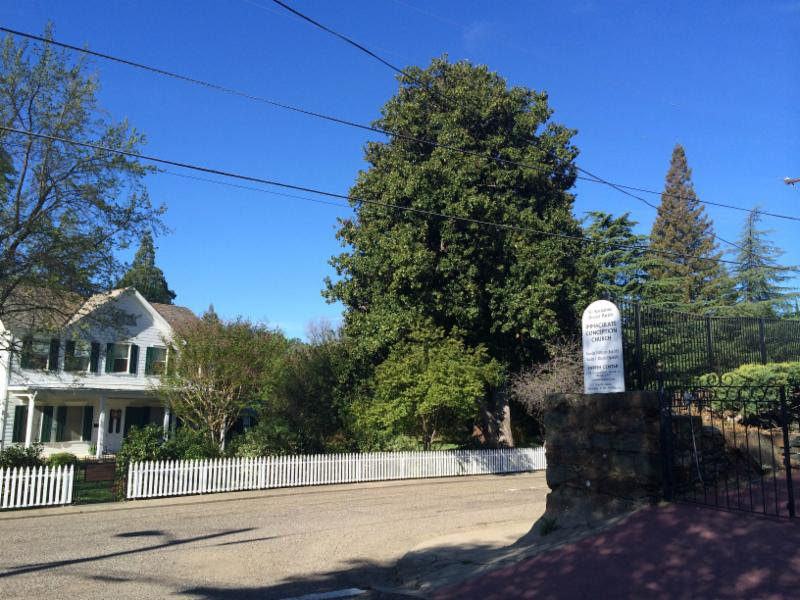 Both of these trees still stand very tall today at 175 Spanish Street now owned by the Pinotti Family. 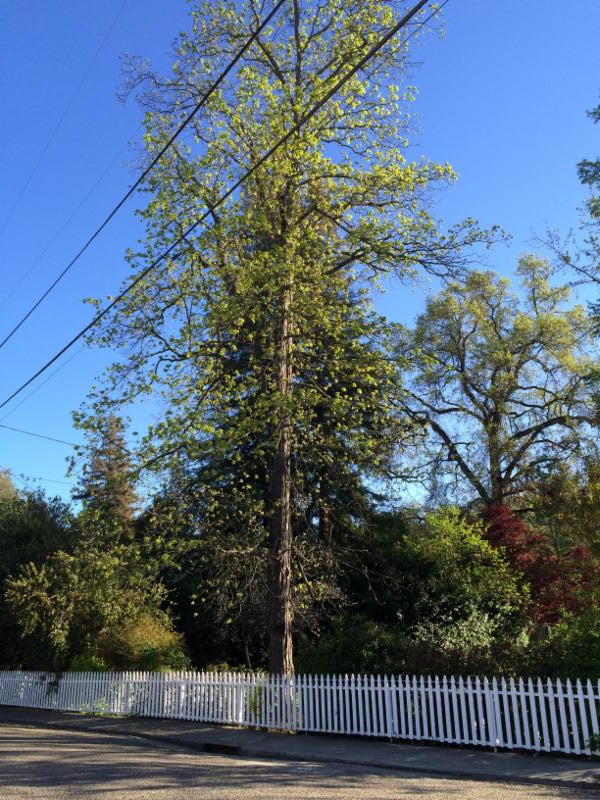 In fact according the Official Registry of California Big Trees at Cal Poly San Luis Obispo the Southern Magnolia at 80 feet tall with a 78 foot canopy (to the right of the house if looking from Spanish Street) and the Shagbark Hickcory at 78 feet tall (to the left of the house) are the largest of their species in California.